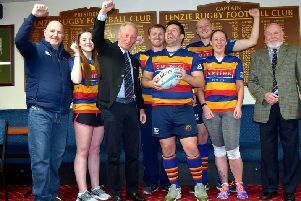 The Milngavie side racked up seven tries, the first when good passing and a series of pick and drives led to prop Glen Sutherland scoring under the posts, Blair Smith converting. West extended their lead when they broke out, a chip and chase from Alexander Fisken reaching Ross Carnegie who nearly scored but recycled to Darren Allen who forced his way over the line. Smith again did the honours to make it 14-0. Ardrossan had a lot at stake and a good passing move from a lineout found winger Calum McKechnie who grounded in the corner, Jack Anderson converting. The visitors were back in it, but West had other ideas. Ross McAulay found a big hole in the Ardrossan defence, was halted but recycled via Mark Sim to Carnegie who shimmied past two defenders to score. Smith had his kicking boots on and made it 21-7. Ardrossan clawed a try back, unconverted, when Stewart Lamont grounded following a driving maul. But West weren’t finished for the half and got the bonus point when Ardrossan threw a pass straight into the path of the onrushing Jamie McAulay who found an open field to score under the posts. Smith’s boot made the half time score 28-12. West carried on the good work in the second half and some good work from a determined Darren Allen saw the ball reach Mark Jenkinson who is turning into a lethal finisher from close range. Once more Smith converted and West were comfortable at 35-12. The home side were dominating the scrums and after some elected scrum penalties, Fraser Smeaton broke off the base and passed to Smith who grounded to make it 40-12 - for once not converting his own try. West scored again just before time, Smeaton scoring off the back of a driving maul. Time was up so a drop kick conversion was unsuccessfully attempted.